Danny Smith is a proud member of a rarefied group; he’s one of the only people on the planet who has been an active skydiver for half a century. This year, as he celebrates his 50th year in the air, the dropzone he founded–the world-famous Skydive Carolina–celebrates a birthday of its own, with thirty candles in the cake. Pictured Above: Danny Smith and Skip Summers after a night demo jump at Clemson’s Tigerama in 1991. The pair landed in front of 40,000 people. When Danny started skydiving, he was in the Air Force. Since he was an avid athlete in high school, it’s no surprise that a Golden Knights demo jump into an airbase event put stars in the young NCO’s eyes. After a little sniffing around, he discovered a closeby skydiving club: the Ark-LA-Tex Skydivers, near Shreveport. In 1966, he made his first jump. It was everything he thought it would be. He was hooked. 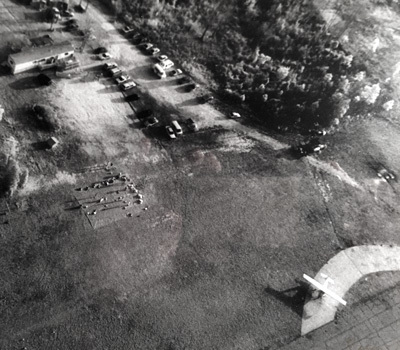 That first dropzone in Shreveport was on public land; the landing area was an enormous field banded by a grass strip runway, and there was nothing else on the property. This was the club’s second location; they had previously been based at a more upscale location with a paved tarmac in Mansfield, Louisiana. They didn’t have a plane either, so one of the club members who worked for an aviation company sorted them out. He would rent a Cessna airplane, bring it to the grass strip, take the door off and the seat out, and open manifest. Finally, after scraping by for a while, one of the members organized a Stinson Gullwing V77 for the club. 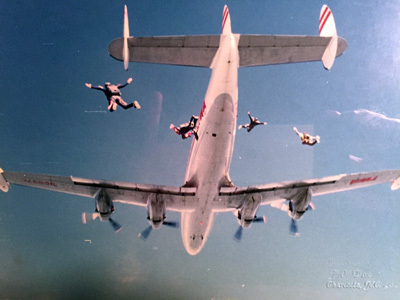 Photo Right: Danny Smith (jumper on far left) exits a Boeing Constellation, “Connie” during the 1996 World Free Fall Convention in Quincy, Illinois. Danny’s appetite for skydiving was ravenous by the time he matriculated from the active duty Air Force and moved back to his North Carolina home. “I had a whopping 12 jumps when I got back to Asheville,” Smith laughs, “so the first question I asked when I went on to college was where I could skydive.” As it turned out, there was nothing in the Asheville area; the closest dropzone was the Charlotte Skydivers Club and that’s where Danny ended up jumping for many years. College led the young Danny directly into corporate America. He pressed a suit, tugged on a necktie, and strode into a long-lived professional career as a banker for First Union National Bank. The suit, of course, disappeared on Friday afternoons, and the buttoned-up young banker headed out for flurries of weekend skydives. He managed to rearrange his work schedule so he could join the club for Tuesday afternoon jumps which became a sacred tradition. In 1975, Danny’s skydiving took on an additional dimension: performing. That spring, an Ohio gentleman by the name of Paul McCowan approached Danny at the dropzone with a proposal. The company he worked for owned three regional amusement parks: Kings Dominion, Kings Island and Charlotte’s own Carowinds. They were looking to run air shows on a regular basis which would be sponsored by Firestone Tire and Rubber. McCowan had been tapped to continue the skydiving element of the program at Carowinds and was look for skydivers. Someone had suggested that McCowan talk to Danny and Danny leapt at the opportunity. From 1975 to 1981, Danny served as the captain of that Carowinds team, every single weekend. 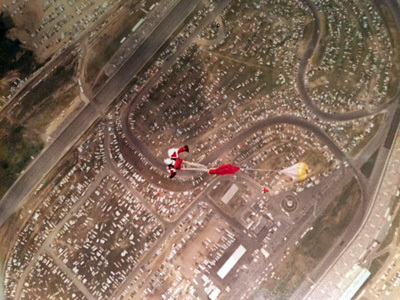 Above: Practicing accuracy landing at the Charlotte Skydivers Club in 1980. The team was comprised of three members – just the right staffing to squeeze into a Cessna 182 which, by that time, Danny happened to own. The trio did a lot of shows outside of the park; they advertised for Firestone and Carowinds with their canopy showmanship at places like the Charlotte Motor Speedway, Wilmington’s annual Azalea Festival and lots of fairs. For Danny, the most memorable of these demos was the day they jumped the battleship. The idea popped up after a demo when the team landed in the grass right next to the docked USS North Carolina. As they were bundling up their gear, the Firestone rep that was in the audience sidled up to Danny. He asked Danny, “Hey, do you think you can land on an aircraft carrier?”, and Danny replied, “I don’t see why not.” Danny says he’s glad he took the challenge as that demo is still “the most memorable jump” he’s ever made. 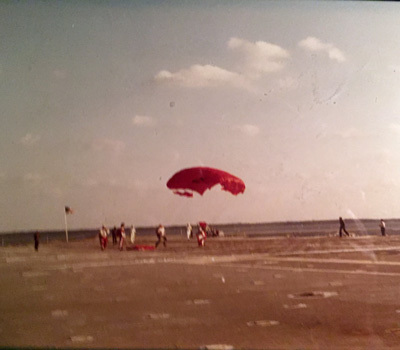 The team traveled to Charleston to do a technical requisition of the proposed jump from high over the water, down to the deck of the venerable USS Yorktown. Right: June 16, 1978. Landing on the USS Yorktown. 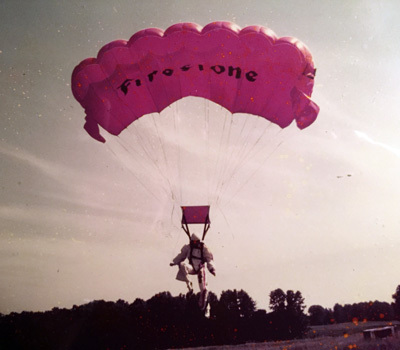 In 1988, the nascent dropzone was already adding a second 182 to the fleet, but Danny was still full-time at the bank, and he barely had a staff. He’d regularly leave the bank at 6pm in the afternoon and spend the rest of his hours at the airfield. “I was an officer in the bank, so I had managers working for me,” he explains, “I was able to spend some time away whenever I needed to, and I had a good boss who knew what I did and supported me in that respect.” He’d often work into the night, doing the rigging, packing the parachutes and seeing to the aircraft. Above: The DZ used to be located on the southeast side of the field. This photo taken in 1988. Packing used to take place on the tarp. Once both planes were turning, demand came running to meet the supply. Soon, both airplanes were going on both Saturdays and Sundays, which did much to improve the aforementioned bank account. Predictably, that zippy twin-engine got very popular. Around 1992, Paul Fayard, another of Danny’s mentors, approached Smith about leasing a King Air from him. 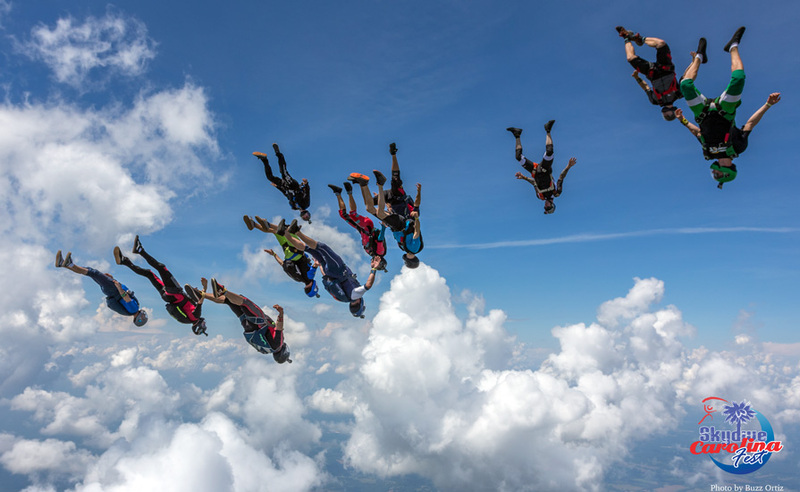 It took some doing, but having a 14-seater aircraft did much to build Skydive Carolina’s customer base and student program. By 1994, Smith was ready to walk away from banking for good and go full-time into dropzone operation, and he arranged to trade that King Air for one of Paul’s Twin Otters. The fleet kept growing, and the planes kept improving. Paul helped Danny buy his first King Air; soon after, the dropzone purchased a Caravan. These days, the dropzone operates a King Air, a Twin Otter, and a Cessna 182. Right: 1980. Danny Smith jumping into the Charlotte Motor Speedway for what was then known as the NASCAR World 600. What had started as a single, multi-purpose building, grew as well. When the old glider operation moved away to open up its own private field, Skydive Carolina took over their hangar. Then, of course, there’s CarolinaFest. 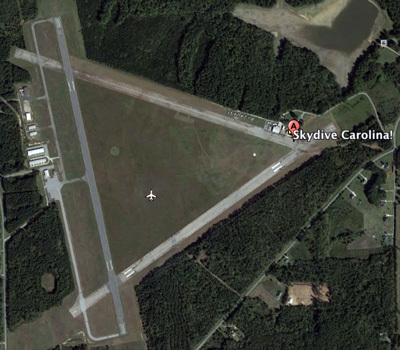 Nearly every skydiver on the planet knows about CarolinaFest. It’s one of the sport’s most famous boogies; driven to the top of the heap by word-of-mouth that trumpets the boogie’s top-shelf quality, spot-on organization and week-of-a-lifetime fun. In 2009, James La Barrie, Skydive Carolina’s General Manager, brought Danny an idea: Let’s host boogies like the rest of the world’s destination drop zones. It was the perfect suggestion at the perfect time, and the results were epic. Hard work, you ask? Yes. CarolinaFest 2016 saw 6,279 skydives in four and a half days. How and When Did Skydiving Start? 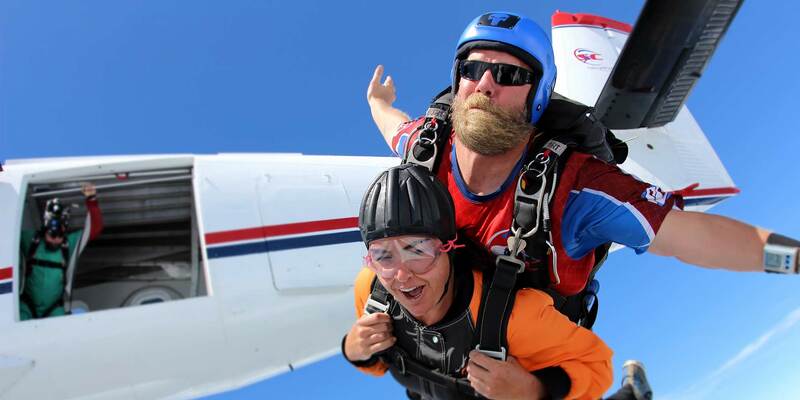 Can You Wear Contacts Skydiving?